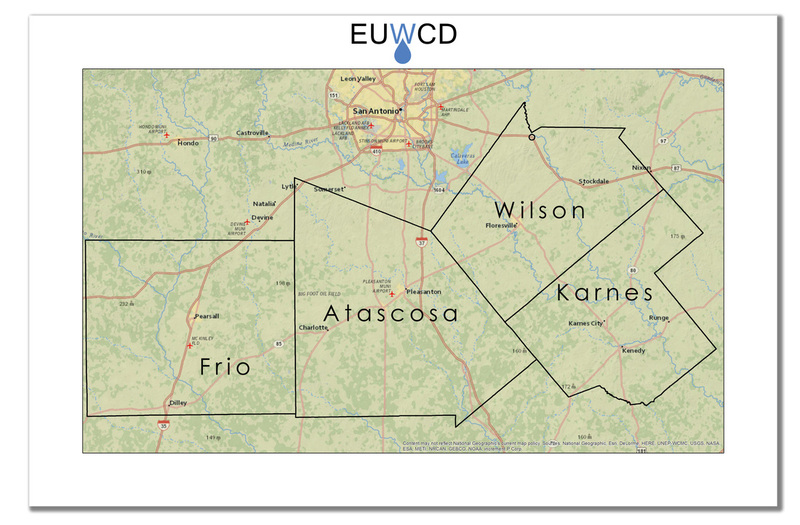 The Evergreen Underground Water Conservation District was created in 1965 in accordance with Section 59, Article 16 of the Constitution of the State of Texas, as a two county Groundwater Conservation District encompassing Atascosa and Wilson Counties. On September 3, 1984 , representatives of Frio County expressed an interest in adding Frio County to the District. On April 6, 1985 , an election was held to ratify the incorporation of Frio County , and elect two representatives to the Board of Directors, which passed. In September of 1997, the Karnes County Commissioners Court petitioned the District with a request to be annexed into the District. On January 17, 1998 the District held an election in Karnes County to ratify the petition, and elect two Directors. The election passed by an eighty-nine percent margin. The Board of Directors currently consists of nine Directors, two at-large Directors from each County, and one Governor Appointed Director. The District encompasses all of Atascosa, Frio, Wilson, and Karnes Counties. This includes 2,461,000 acres or 3,845 square miles. The District's economy has traditionally been heavily dependent upon agriculture and agriculture related business. The recent development of the Eagle-Ford Shale has contributed to a more diversified economic landscape. Rainfall in the District averages from 24 inches per year in Frio County , to 32 inches per year in Wilson County . Rainfall usually peaks in the late spring, with a secondary peak in early fall. Due to this trend and high summer temperatures, irrigation is required for consistent crop production and yield. Approximately 70% of the total groundwater pumpage in the District is used in Agriculture.